A unanimous Award has been issued today by the Tribunal constituted under Annex VII to the UnitedNations Convention on the Law of the Sea (the “Convention”) in the arbitration instituted by the Republic of the Philippines against the People’s Republic of China. Historic Rights and the ‘Nine-Dash Line’: The Tribunal found that it has jurisdiction to consider the Parties’ dispute concerning historic rights and the source of maritime entitlements in the South China Sea. On the merits, the Tribunal concluded that the Convention comprehensively allocates rights to maritime areas and that protections for pre-existing rights to resources were considered, but not adopted in the Convention. Accordingly, the Tribunal concluded that, to the extent China had historic rights to resources in the waters of the South China Sea, such rights were extinguished to the extent they were incompatible with the exclusive economic zones provided for in the Convention. The Tribunal also noted that, although Chinese navigators and fishermen, as well as those of other States, had historically made use of the islands in the South China Sea, there was no evidence that China had historically exercised exclusive control over the waters or their resources. The Tribunal concluded that there was no legal basis for China to claim historic rights to resources within the sea areas falling within the ‘nine-dash line’. Status of Features: The Tribunal next considered entitlements to maritime areas and the status of features. The Tribunal first undertook an evaluation of whether certain reefs claimed by China are above water at high tide. Features that are above water at high tide generate an entitlement to at least a 12 nautical mile territorial sea, whereas features that are submerged at high tide do not. The Tribunal noted that the reefs have been heavily modified by land reclamation and construction, recalled that the Convention classifies features on their natural condition, and relied on historical materials in evaluating the features. The Tribunal then considered whether any of the features claimed by China could generate maritime zones beyond 12 nautical miles. Under the Convention, islands generate an exclusive economic zone of 200 nautical miles and a continental shelf, but “[r]ocks which cannot sustain human habitation or economic life of their own shall have no exclusive economic zone or continental shelf.” The Tribunal concluded that this provision depends upon the objective capacity of a feature, in its natural condition, to sustain either a stable community of people or economic activity that is not dependent on outside resources or purely extractive in nature. The Tribunal noted that the current presence of official personnel on many of the features is dependent on outside support and not reflective of the capacity of the features. The Tribunal found historical evidence to be more relevant and noted that the Spratly Islands were historically used by small groups of fishermen and that several Japanese fishing and guano mining enterprises were attempted. The Tribunal concluded that such transient use does not constitute inhabitation by a stable community and that all of the historical economic activity had been extractive. Accordingly, the Tribunal concluded that none of the Spratly Islands is capable of generating extended maritime zones. The Tribunal also held that the Spratly Islands cannot generate maritime zones collectively as a unit. Having found that none of the features claimed by China was capable of generating an exclusive economic zone, the Tribunal found that it could—without delimiting a boundary—declare that certain sea areas are within the exclusive economic zone of the Philippines, because those areas are not overlapped by any possible entitlement of China. South China Sea. Having found that certain areas are within the exclusive economic zone of the Philippines, the Tribunal found that China had violated the Philippines’ sovereign rights in its exclusive economic zone by (a) interfering with Philippine fishing and petroleum exploration, (b) constructing artificial islands and (c) failing to prevent Chinese fishermen from fishing in the zone. The Tribunal also held that fishermen from the Philippines (like those from China) had traditional fishing rights at Scarborough Shoal and that China had interfered with these rights in restricting access. The Tribunal further held that Chinese law enforcement vessels had unlawfully created a serious risk of collision when they physically obstructed Philippine vessels. Harm to Marine Environment: The Tribunal considered the effect on the marine environment of China’s recent large-scale land reclamation and construction of artificial islands at seven features in the Spratly Islands and found that China had caused severe harm to the coral reef environment and violated its obligation to preserve and protect fragile ecosystems and the habitat of depleted, threatened, or endangered species. The Tribunal also found that Chinese authorities were aware that Chinese fishermen have harvested endangered sea turtles, coral, and giant clams on a substantial scale in the South China Sea (using methods that inflict severe damage on the coral reef environment) and had not fulfilled their obligations to stop such activities. Aggravation of Dispute: Finally, the Tribunal considered whether China’s actions since the commencement of the arbitration had aggravated the dispute between the Parties. The Tribunal found that it lacked jurisdiction to consider the implications of a stand-off between Philippine marines and Chinese naval and law enforcement vessels at Second Thomas Shoal, holding that this dispute involved military activities and was therefore excluded from compulsory settlement. The Tribunal found, however, that China’s recent large-scale land reclamation and construction of artificial islands was incompatible with the obligations on a State during dispute resolution proceedings, insofar as China has inflicted irreparable harm to the marine environment, built a large artificial island in the Philippines’ exclusive economic zone, and destroyed evidence of the natural condition of features in the South China Sea that formed part of the Parties’ dispute. An expanded summary of the Tribunal’s decisions is set out below. 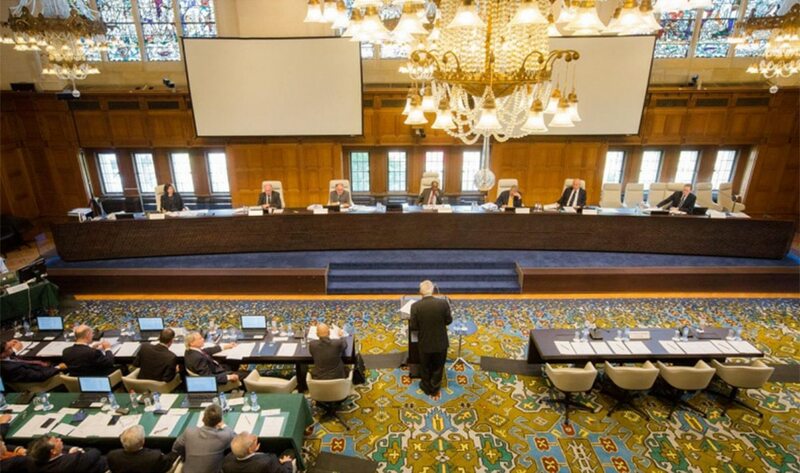 Photograph: Hearing in session, July 2015, Peace Palace, The Hague. Clockwise from top left: Registrar and PCA Senior Legal Counsel Judith Levine; Judge Stanislaw Pawlak; Professor Alfred H. A. Soons; Judge Thomas A. Mensah (Presiding Arbitrator); Judge Jean-Pierre Cot; Judge Rüdiger Wolfrum; PCA Senior Legal Counsel Garth Schofield; former Secretary for Foreign Affairs of the Philippines, Mr. Albert F. Del Rosario; former Solicitor General Mr. Florin T. Hilbay, Counsel for the Philippines; Mr. Paul S. Reichler; Professor Philippe Sands; Professor Bernard H. Oxman; Professor Alan E. Boyle; Mr. Lawrence H. Martin. The South China Sea Arbitration between the Philippines and China concerned an application by the Philippines for rulings in respect of four matters concerning the relationship between the Philippines and China in the South China Sea. First, the Philippines sought a ruling on the source of the Parties’ rights and obligations in the South China Sea and the effect of the United Nations Convention on the Law of the Sea (“Convention”) on China’s claims to historic rights within its so-called ‘nine-dash line’. Second, the Philippines sought a ruling on whether certain maritime features claimed by both China and the Philippines are properly characterized as islands, rocks, low-tide elevations or submerged banks under the Convention. The status of these features under the Convention determines the maritime zones they are capable of generating. Third, the Philippines sought rulings on whether certain Chinese actions in the South China Sea have violated the Convention, by interfering with the exercise of the Philippines’ sovereign rights and freedoms under the Convention or through construction and fishing activities that have harmed the marine environment. Finally, the Philippines sought a ruling that certain actions taken by China, in particular its large-scale land reclamation and construction of artificial islands in the Spratly Islands since this arbitration was commenced, have unlawfully aggravated and extended the Parties’ dispute. Although China has not made equivalent public statements with respect to the merits of the majority of the Philippines’ claims, the Tribunal has sought throughout the proceedings to ascertain China’s position on the basis of its contemporaneous public statements and diplomatic correspondence. The Tribunal examined the history of the Convention and its provisions concerning maritime zones and concluded that the Convention was intended to comprehensively allocate the rights of States to maritime areas. The Tribunal noted that the question of pre-existing rights to resources (in particular fishing resources) was carefully considered during the negotiations on the creation of the exclusive economic zone and that a number of States wished to preserve historic fishing rights in the new zone. This position was rejected, however, and the final text of the Convention gives other States only a limited right of access to fisheries in the exclusive economic zone (in the event the coastal State cannot harvest the full allowable catch) and no rights to petroleum or mineral resources. The Tribunal found that China’s claim to historic rights to resources was incompatible with the detailed allocation of rights and maritime zones in the Convention and concluded that, to the extent China had historic rights to resources in the waters of the South China Sea, such rights were extinguished by the entry into force of the Convention to the extent they were incompatible with the Convention’s system of maritime zones. Finally, the Tribunal considered the Philippines’ request for a declaration that, going forward, China shall respect the rights and freedoms of the Philippines and comply with its duties under the Convention. In this respect, the Tribunal noted that both the Philippines and China have repeatedly accepted that the Convention and general obligations of good faith define and regulate their conduct. The Tribunal considered that the root of the disputes at issue in this arbitration lies not in any intention on the part of China or the Philippines to infringe on the legal rights of the other, but rather in fundamentally different understandings of their respective rights under the Convention in the waters of the South China Sea. The Tribunal recalled that it is a fundamental principle of international law that bad faith is not presumed and noted that Article 11 of Annex VII provides that the “award . . . shall be complied with by the parties to the dispute.” The Tribunal therefore considered that no further declaration was necessary. Read the international tribunal's full statement on its decision.